Winner need not be present. In the event of a tie, that prize will be split. June 13, 2016: The Annual Golf Ball Drop was held June 13th at Hopkins Elementary School. It was a huge success raising just nearly $5000 that will be used toward funding the next cycle of educational grant awards to the Hopkinton Public Schools. This year’s lucky ball was #181, who landed just near the cup!! Congratulations go to our winner, Libby Skiba of Hopkinton. The $100 consolation prize for the ball that landed the furthest from the “pin” was awarded to Jen Kelly of Hopkinton. 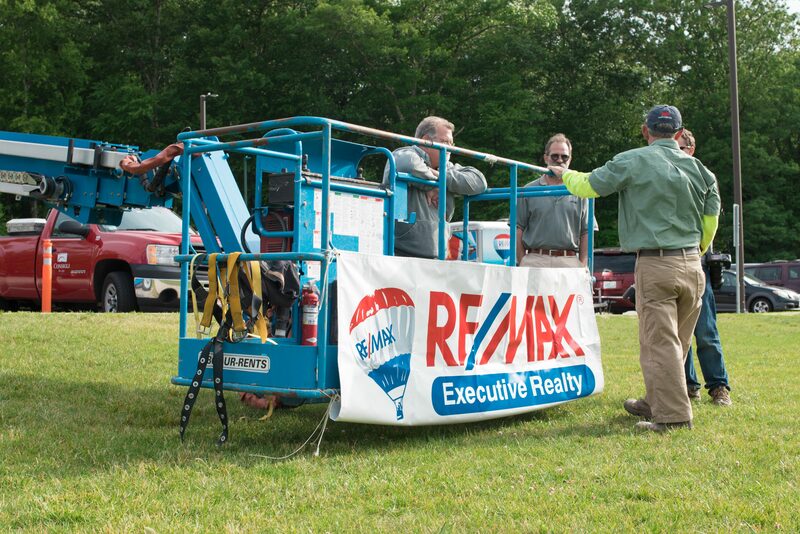 Thank you to Re/Max Executive Realty for their continued support in sponsoring the event and generosity in donating the hot air balloon. Unfortunately, the wind didn’t cooperate this year, and we weren’t able to take balloon rides. We had to rely on Consigli Construction of Milford who provided us with an 85’ lift to drop the 1,000 golf balls. The crowd of more than 150 people enjoyed face painting, games and treats under the early evening summer skies.